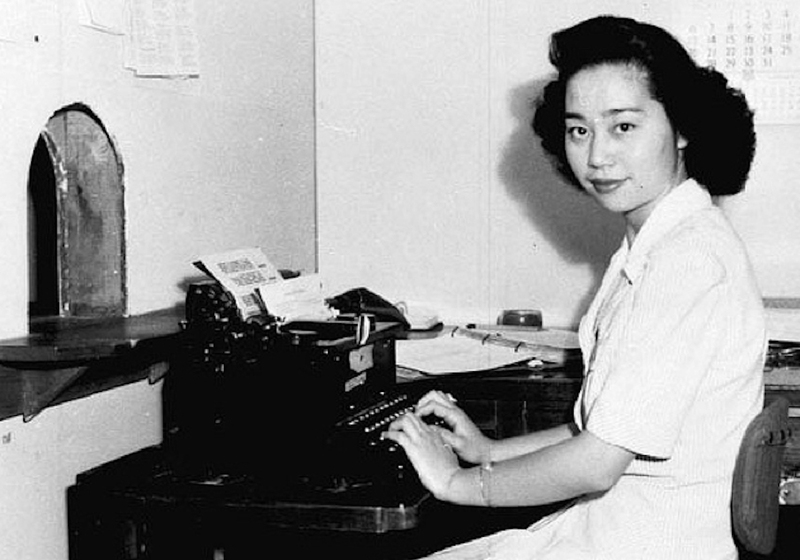 Mitsuye Endo was a plaintiff in the landmark lawsuit that ultimately led to the closing of the concentration camps and the return of Japanese Americans to the west coast in 1945. Courtesy of Densho. That reality could be upon us shortly—any time after Donald Trump is inaugurated into the White House. Following the November 2015 Paris attacks, Mr. Trump had called for the registering and tracking of American Muslims. Just after his election in November, the press and internet exploded with news that his transition team was seriously considering a Muslim registry. Then, members of his camp began to cite Japanese internment as precedent for a Muslim registry. Carl Higbie, a prominent Trump supporter, gave an interview with the New York Times in which he conceded that the internment camps were “horrific,” but insisted that Korematsu serves as “historical, factual precedent to do things that are not politically popular and sometimes not right, in the interest of national security.” For many Americans familiar with Korematsu and the history of Japanese internment, such statements were shocking. The Korematsu decision has long been widely discounted as precedent in legal circles and taught as a tragic failure of American values in history classes. By now, it is evident that the internment of 120,000 Japanese Americans—three-quarters of whom were U.S. citizens, the rest immigrants who were not permitted to become citizens, and all of whom were interned without due process—was based on fear, panic, and racism. Korematsu is widely acknowledged as a civil rights disaster. Earl Warren, who as Attorney General of California had been a leading proponent of internment, came to deeply regret his role. Scalia—commonly remembered as one of the most influential conservative justices to sit on the nation’s highest court—ranked Korematsu among the most egregious decisions in Supreme Court history, along with Dred Scott, while Justice Stephen Breyer has written that Korematsu has been so thoroughly discredited that it is hard to conceive of any future court referring to it favorably or relying on it. In 1988, President Ronald Reagan signed the Civil Liberties Act, issuing an apology and compensation as redress for the wrongful internment of Japanese Americans. And in 2011, the Department of Justice—finally—officially conceded that it committed grave error in the Korematsu case 67 years prior when the government submitted false and incomplete evidence, and suppressed the fact that FBI and military investigations refuted claims of Japanese American disloyalty. This concession obliterated any lingering doubt over Korematsu’s utter lack of value as legal precedent for interning American citizens. Korematsu, in other words, is a lesson of what not to do. This is not simply a case of hindsight. When the Korematsu Court decided to uphold the government’s decision to intern Japanese Americans as a “military necessity,” it did so even as the government was dismantling the internment policy. The rounding up and internment of Japanese Americans had begun in May 1942, but before the end of the year, many young Japanese Americans were released from the camps to attend colleges in the Midwest and the East, while others were released to provide much-needed labor, especially in the fields. The Korematsu decision has long been widely discounted as precedent in legal circles and taught as a tragic failure of American values in history classes. Never mind that the government never interned Japanese Americans en masse in Hawaii, which had the highest concentration of Japanese Americans in the country, and which was the physical location of the Pearl Harbor attack that triggered the mass incarceration. Concerned that the removal and exclusion of Japanese residents would cause economic ruin for the territory, officials rejected the idea of wholesale internment on the islands. Then in early 1943, the government circulated the infamous “Loyalty Questionnaire,” with the hope of recruiting interned Japanese Americans into the military. The irony was not lost on the interned, who had been forced behind wire fences based on racialized notions of ancestry and disloyalty—in other words, suspected as persons incapable of ever fully becoming Americans—and then were asked to fight for the U.S. On February 1, 1943, President Roosevelt announced his decision to let Japanese Americans enlist, and more than 26,000 served in the U.S. Army during the war. On December 17, 1944, Roosevelt issued Public Proclamation No. 21, ordering the internment camps to be closed and all remaining Japanese Americans to be released. The very next day—December 18, 1944—the Supreme Court released its Korematsu decision, upholding the constitutionality of the government’s internment policy and affirming the conviction of Fred Korematsu, 23-year-old Japanese American welder from San Leandro, California who had defied the government order to move to an internment camp. But that was not all. On the same day, the Court also released its decision on another lesser-known but arguably more important case dealing with internment: Ex Parte Endo. Mitsuye Endo had lived in the California capital of Sacramento, worked for the California Department of Motor vehicles, was a practicing Christian, could neither speak nor read Japanese, and had a brother in the U.S. Army. Nonetheless she’d been subjected to the extreme discrimination all Japanese Americans were made to endure at the time, and had been forced into an internment camp. In the Endo case, the Court unanimously ruled that the U.S. government could not continue to detain a citizen who was “concededly loyal” to the United States. It stressed that “[a] citizen who is concededly loyal presents no problem of espionage or sabotage. Loyalty is a matter of the heart and mind, not of race, creed, or color. He who is loyal is, by definition, not a spy or a saboteur.” The Court found that as a loyal citizen, Endo was entitled to unconditional release from the internment camp. It has never been clear to me why the case of Endo—the case which legally brought the internment camps to a close—has been so overshadowed by Korematsu. But if we are to call upon history to help us make decisions today, we need to look at the whole picture, and not rely upon selective memories. By the time the Supreme Court rendered its decisions, the government’s decision to intern Japanese Americans based on assertions of “military necessity” and wartime exigencies were directly undercut by its own actions. Indeed, the same Court that seemingly upheld the internment of Japanese Americans in Korematsu affirmed in Endo the right of those very same Japanese Americans to not be detained and interned. One could distinguish the niceties of the different constitutional or legal bases underlying the two cases and varying outcomes, but the very need to make such fine jurisprudential distinctions, I would argue, points to the practical inconsistencies. The history that some are invoking as support for a Muslim registry is not at all what they think it is. If the next administration tries to pass a Muslim registry, it will test our core values as a nation and as a people. Admittedly, historians have been a bit more wary of narratives about American exceptionalism, but one thing that historians—from the most conservative to the most liberal—have not backed away from is the Constitution, and the idea that America should live up to its foundational ideals. Fear, prejudice, racial and religious antipathy should never be the basis for government policy, at least not in a republic that has worked so hard for nearly two and a half centuries to protect and promote a Constitution cherished for its democratic values and commitment to freedom. Inter arma enim silent leges. This was the ancient saying that Scalia frequently invoked to explain how bad history could still repeat itself. “In times of war, the law may fall silent.” But we, the people, can’t. Nunquam iterum–never again. Julian Lim is an assistant professor of history in the School of Historical, Philosophical, and Religious Studies at Arizona State University, Tempe. She works on immigration and the U.S.-Mexico border region, and will be releasing a book through the University of North Carolina Press later this year.